Korky Paul, Chocolate Extravaganza, Dad’s n’Lads storytelling at the Rugby Club…and have you booked your place at our Conference yet? Comments Off on Korky Paul, Chocolate Extravaganza, Dad’s n’Lads storytelling at the Rugby Club…and have you booked your place at our Conference yet? The Federation of Children’s Book Groups has been entertaining and enthralling children of many nationalities, abilities and ages in the local groups. Below are some of the events that our local groups have been enjoying with member schools and families over the past few weeks. Reading has been working hard on finalising the Conference and the national Executive has been ending the Jean Russell Storytelling Project on a high with Oxford as well as planning for the next Children’s Book Award Top Ten shortlist and ceremony and National Share-A-Story Month 2017. The Early Bird Discount for Conference Write Around the World ends on Friday 16th December. Click here for the booking form. If you would like to read more about our Jean Russell Storytelling Project, funded by the Ragdoll Foundation, there will be a final blog to come, and if you are interested in becoming involved in testing our Top Ten shortlist e-mail us on cba@fcbg.org.uk to go on the list to be the first to hear the news in early February. South Bucks CBG celebrated National Non-Fiction November with a Chocolate Extravaganza, with the topic being so popular tickets more or less sold themselves! Alex Woolf, author of “The Story of Chocolate”, spoke first about the history of chocolate and illustrated his talk with some excellent visual aids. 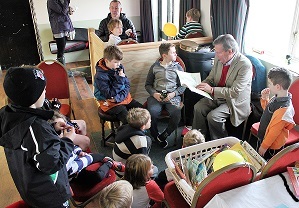 After the children had participated in some activities, including lolly, kebab, book and box making, Mark Hawtree, a local food historian, was able to re-use Alex’s slides in his engaging and entertaining account of chocolate-making. Chocolate tasting and hot chocolate drinking were all well received and the Traidcraft stall was busy selling a variety of fairly-traded chocolate. Janice Saunders of South Bucks said: ‘There were 23 children and teenagers present. Between them, they represented 9 nationalities, spoke 8 languages and attended 10 different schools. This is a richness which we find enormously heartening’. Lincs CBG says: “Korky Paul delighted primary school children in Lincolnshire over a two day trip, by visiting four schools and by holding an intimate evening event in a local library. 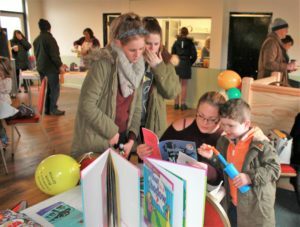 Thanks to Harlequin mum, Erica Davis, the Oxford Children’s Book Group marked National Non-Fiction November with a special Storytelling and Reading event for Dads and Lads at Oxford Rugby Club’s Clubhouse in North Hinksey (Of course Mums, sisters and female rugby players were also welcome!) Altogether there were members of three clubs playing matches on Sunday 27th November, with the Oxford Harlequins and Abingdon playing as well. Moira da Costa of the OCBG ran a book stall of mainly non-fiction books and their ‘resident’ storyteller, Bill Laar ran a short Rugby Quiz and read aloud some ‘back-to-front’ traditional tales, such as the ‘Three Little Wolves and the Big Bad Pig’ be Eugene Trevizas and a few ‘Revolting Rhymes’ by Roald Dahl. Harry, age 4, helped to blow up the OCBG balloons. His mother said she had been reading aloud to him every night since he was a baby, because she knew how important listening to stories can be. She is aware that stories help children develop their vocabulary and language skills. Oxford also celebrated the power of sstory as part of the Federation’s Jean Russell Storytelling Project.